This summer, 39 intrepid educators embarked on a journey that brought them from the skyscrapers of downtown Toronto, to the shores of Kawawaymog Lake in the region of Algonquin Park. With the promise of a wide range of engaging experiences, UnPlug’d 2012 brought together co-learners from Australia, USA, and Canada to share stories about what matters most in education and to collaboratively author a collection of letters that will be published later this fall. When it comes to digesting a good meal, a sense of satiation triggers positive feelings. 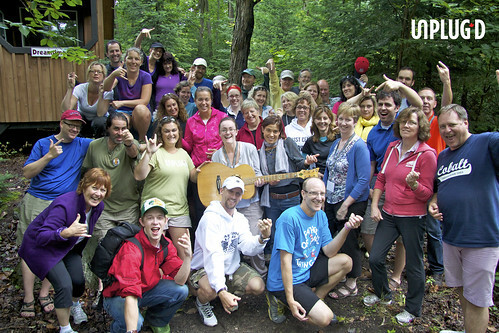 In a similar way, participants engaged in our unique unplugged learning adventure, left UnPlug’d with a feeling of fullness, refueled by deep conversation, nourished by rich natural meals, and refreshed through recreation amid the splendor of Ontario’s near north. While we can measure the success of our event by pointing to the product that we produced, many of the hidden benefits our event, are intangible and immeasurable. How can you summarize the effectiveness of a collaborative writing venture that brings to life the narrative experiences of a diverse group of co-authors? 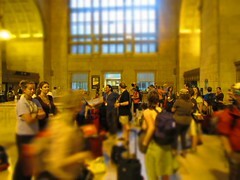 How can one measure the value of a journey in a private rail car filled with kindred spirits? How do you put a value on the achievement of emboldened colleagues who succeeded in their cross-lake swim to an iconic tree on a nearby island? How might you assess the experience of once distant friends sharing their passion for running by connecting for a morning run amidst the wonder of Algonquin region? 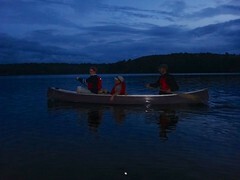 How can anyone measure the magic of an evening paddle to a sauna, swim and campfire, when capped by the shooting stars of the Perseid meteor showers? Is it even worth considering what it means to hold in your hands a guitar that is made up of historic artifacts from across Canada or what it feels like to hear that same guitar played at a campfire or at a private indoor gathering? While educators had to take up the invitation to participate in UnPlug’d 2012, it was through generous sponsorships and donations from a number of Canadian and US EdTech companies, that we were able to set the conditions for a rich and memorable event. We are indebted to many partners who supported our mission to dig into our collective memory, to share experiences with distant colleagues, and to edit and publish our most impassioned ideals. UnPlugd’d participants continue to talk, share, and collaborate by leveraging social media tools, and by gathering for face-to-face meetings and professional development events. Through open conversations on Twitter, and through deeper reflection on personal blogs, participants continue to reflect on their experiences, to consider adaptations to their professional practice, and to lead by learning in public. As our multimedia publications near completion, the dividends from UnPlug’d 2012 are sure to impact connected teacher-learners from Canada and beyond. We invite you to consider coming along for the ride at unplugd.ca. This article was originally written to appear in the MindShare Learning Report.